PJ (and friends) react upon learning about the Sci Fi channel's plan to turn the LotR movies into a six-hour miniseries. Peter: "Holy Crap! I forgot the gang was coming over for LotR Trivial Pursuit and the Pizza And Beer! I am so dead meat right now! Aragorn send over some back up, ASAP!" What's King Kong doing here? Wait! Stop! Wrong movie! What?! Our payroll checks were sent to George Lucas? What do you mean we are out of deodorant?! PJ screams, " What? 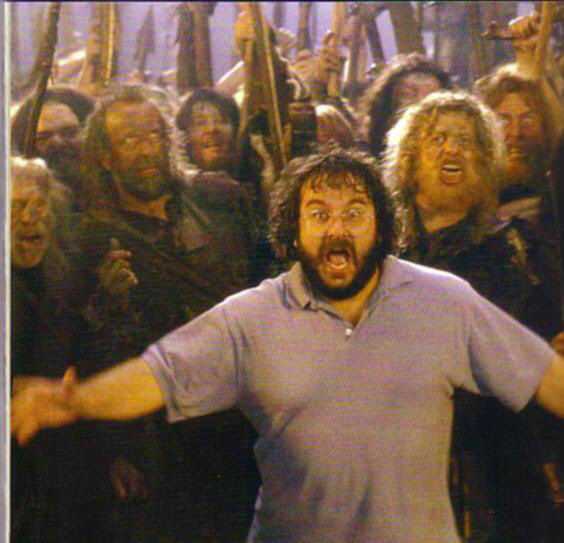 !, your out of Lembas bread, I can't hold my boys back, they want their Lembas bread and they want it now!!!" Peter Jackson runs for his life from a mob of Tolkien purists who are angry at some of the changes in the movie that differ from the book! "What do you mean there's nothing to eat except 'maggoty bread'??"